After more than twenty years of publishing Montessori magazines (Tomorrow’s Child and Montessori Leadership), producing Montessori videos, creating a series of Montessori pamphlets, hosting international conferences, and so much more, the staff of The Montessori Foundation decided that we needed to create an interactive website for Montessori parents who want to learn more about how to support their children at school and at home. Tomorrow’s Child is the primary source that. has provided answers for all these many years. It seems appropriate that readers of Tomorrow’s Child, either as individual subscribers or as parents whose Montessori schools provides them with membership, should have full membership access to these resources. If you are not already a member, there are many options to choose a membership plan that suits your needs. If you are reading this, you’re in exactly the right place. Just keep reading. Welcome! Search our vast library of content curated from over 30 years experience in the field of Montessori. Expert advice at any hour of the day from the comfort of your own home. As a member of the Montessori Family Alliance you also benefit from access to free webinars from the leaders in the field of Montessori education and parenting. The decision to choose Montessori education can be a hard one. Many people will not understand your decision. Membership to the MFA connects you with like-minded people from around the world who support your decision. MFA Membership provides a discount for Montessori parents and caregivers to Lorna McGrath’s Online Montessori Family Alliance Course: Parenting Puzzle. For more information, CLICK HERE. 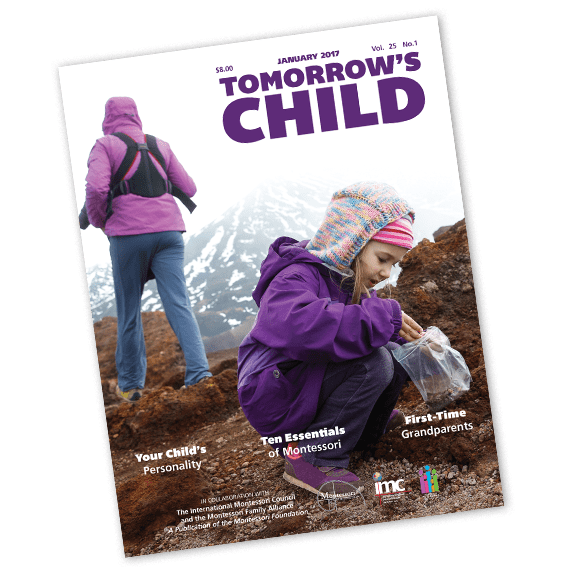 Browse this digital issue of Tomorrow’s Child magazine to explore the meaningful content and great resources you can expect in every issue. Learn more about the Montessori community and ways to enrich your child’s Montessori experience at home, and gain access to leaders in the field of Montessori parenting and education. Individuals can subscribe to the print edition of the Montessori Foundation’s ground-breaking magazine, Tomorrow’s Child, now in its 25th year. Our newest offering, membership to the Montessori Family Alliance, is also a great way to take advantage of the decades of experience and content created by the Montessori Foundation. For this price, individuals living in the US receive four paper and four digital issues per year, plus one extra digital-only issue during the summer. Individual subscribers also receive an introductory membership to the Montessori Family Alliance. For this price, individuals worldwide receive four digital issues per year, plus one extra digital-only issue during the summer. Receive five digital issues per year, plus one extra digital-only issue during the summer. Obtain complete access to all of the members-only resources on the website, including articles, webinars, videos and Q&A with leaders in the field of Montessori education. Upon receipt of your order, you will be provided with log-in information to gain immediate access to the benefits of the Montessori Family Alliance. Schools that wish to provide digital or print issues of Tomorrow’s Child magazine and Montessori Family Alliance memberships to their families may order at a discounted price. includes full Montessori Family Alliance membership for your families / 50 copy min. You receive print editions of Tomorrow’s Child magazine for all of your families. Your families will receive coupon codes granting them free full membership to the Montessori Family Alliance—a value of $60 annually per family. Schools can provide their families with the digital version only of Tomorrow’s Child magazine. Your families will also receive coupon codes to create free memberships to the Montessori Family Alliance. For the individual, this would be a cost of $60 annually. What a great value to provide your families!